Welcome to the Dunes…and not the one in Las Vegas! 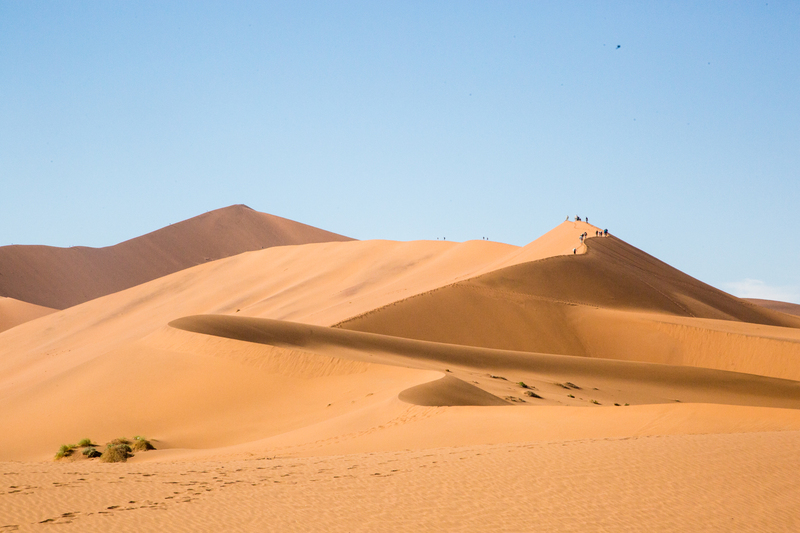 I headed south from Cape Cross toward Swakopmund. Another coastal city. 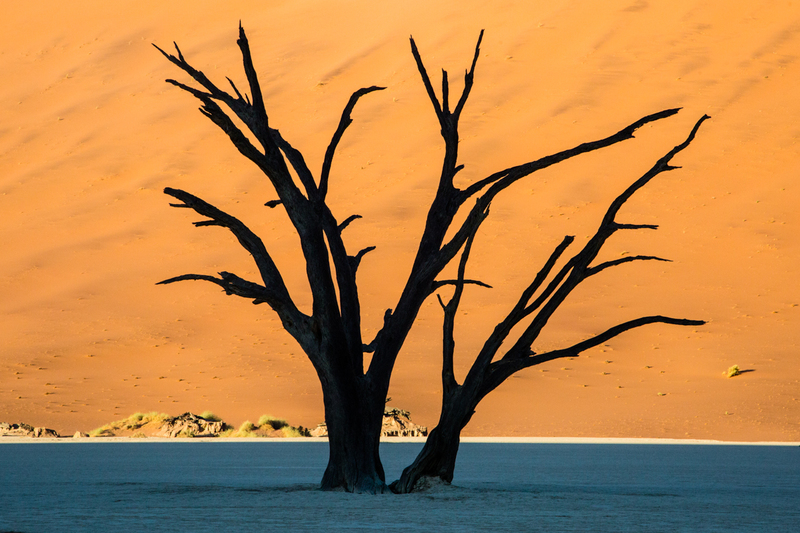 Much of this part of Namibia originated from German settlers. Swakopmund is a pretty good sized city for Namibia. 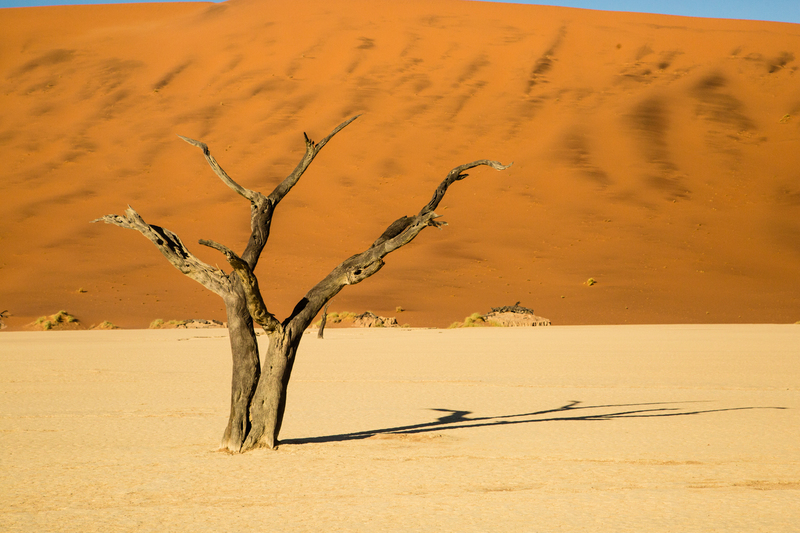 The population of Namibia is 2.2-2.3 million. There are 2.5 million fur seals in the country so they outnumber the residents. Anyway. I didn’t do much of consequence here. Went on a half day catamaran cruise but it’s not worth showing you pictures. 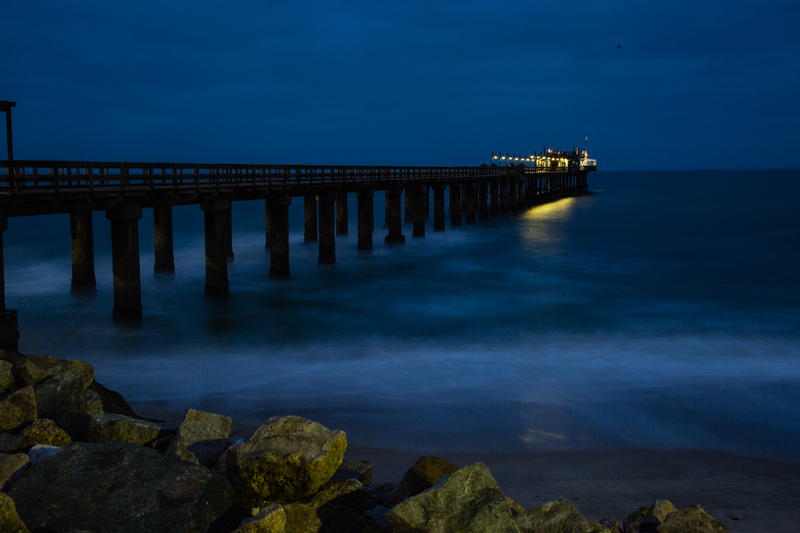 I did go down to the jetty and take this night shot which I think is pretty cool. 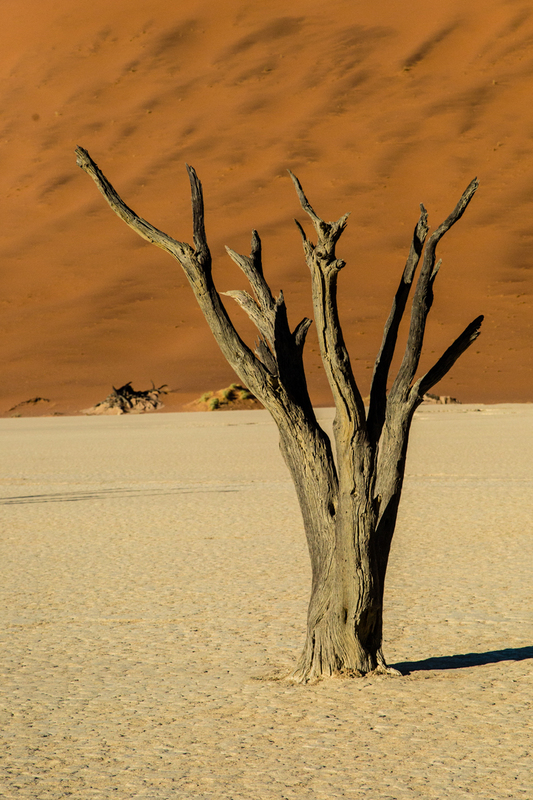 From there it is further south to Sossusvlei which is a location within Namib-Naukluft Park. 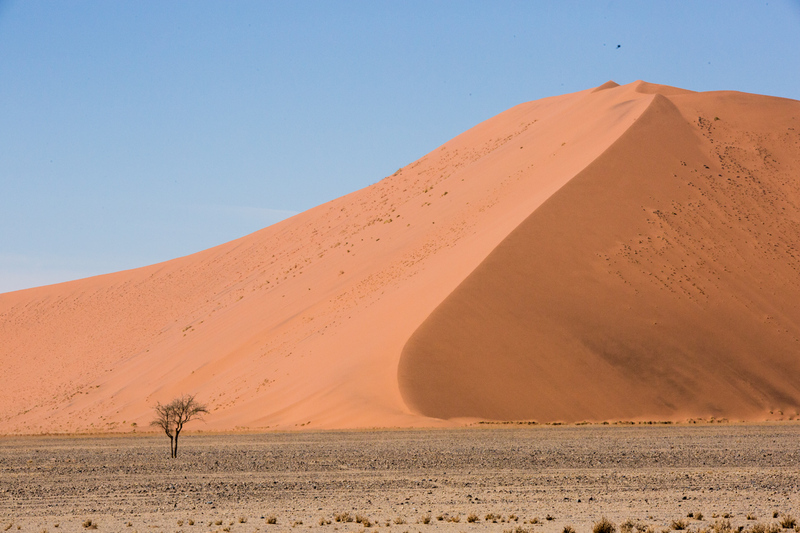 It’s famous for these huge sand dunes ranging in height from 900-1200 feet. 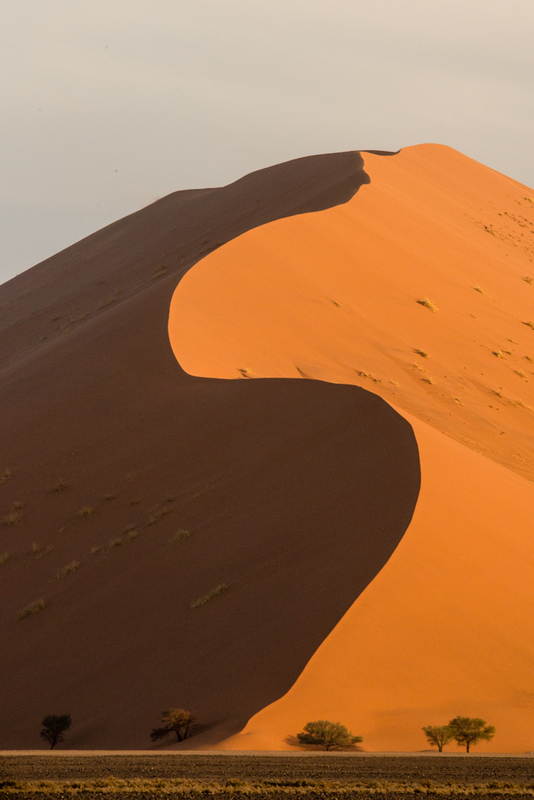 Purported to be the largest sand dunes in the world. The campground, just inside the park, is roughly 40 miles from the dunes. The park gates open to the public at sunrise…6:45am but those of us in the campground get in an hour early. The posted speed limit on the road is 60kpm or about 35 mph. I was the second vehicle in line at the gate when it opened. It was like the Oklahoma land rush. I was trying to keep up with the other vehicles and we were hitting 120kph. Obviously, this isn’t a patrolled road. Everyone wanted to make it before sunrise. There is a parking lot 4 kilometers from the end where all twe-wheeled vehicles have to park but the road goes another 4k for 4×4 vehicles. I was following another truck and was in 4-wheel drive. He got stuck and I stopped to check on him. He was fine and was going to dig out. I went around him and promptly got stuck about 50 yards down the road. I had ask the guys at the reception desk when I checked in if I need to lower my tire pressure and they told me know. Wrong! I got out, lowered the tire pressure and shifted into low, 4-wheel drive and pulled right out the rut. 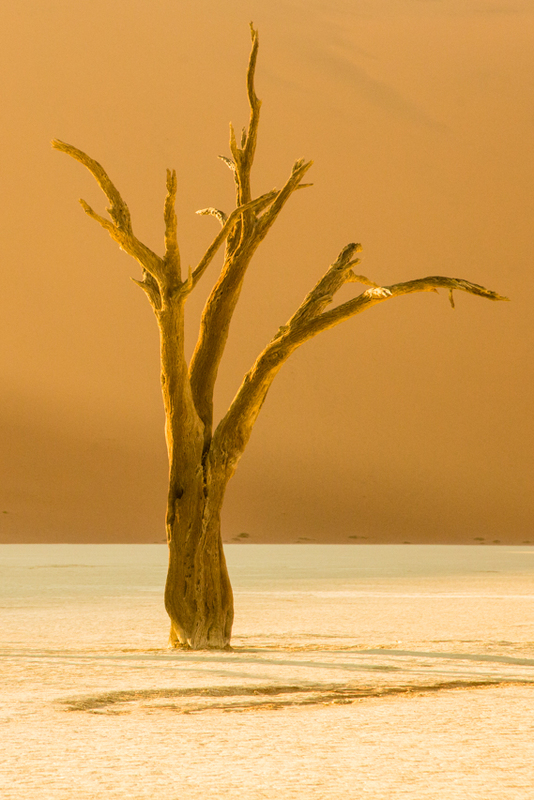 I wanted to photograph an area called Deadvlei. 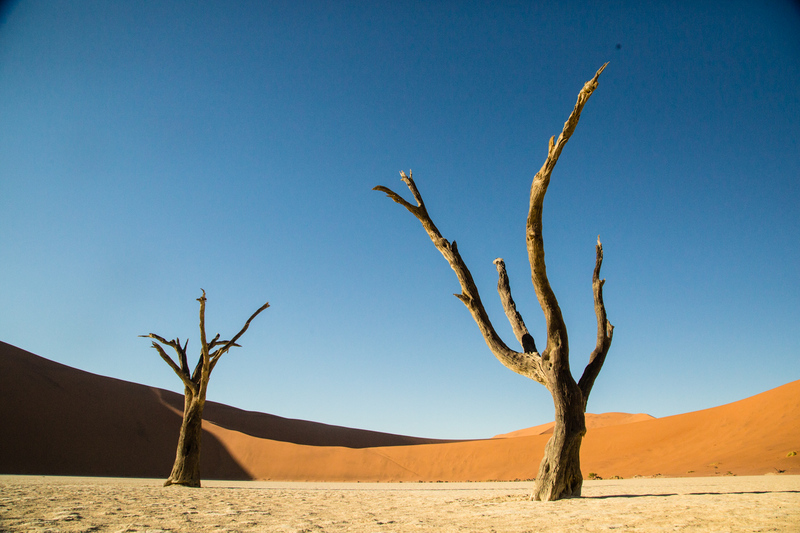 It is a white clay pan that once was a shallow pool of water that allowed camel thorn trees to grow. 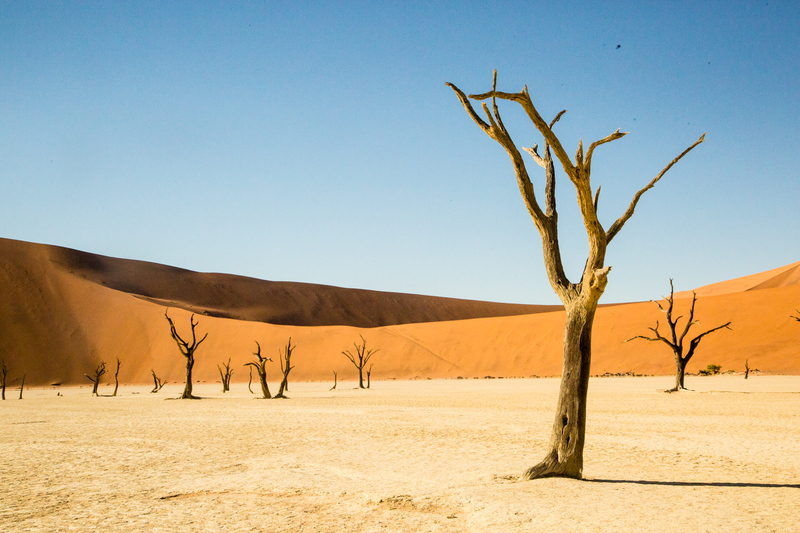 When the climate changed, drought came and the sand dunes encroached on the area and cut off the water supply. The trees died. 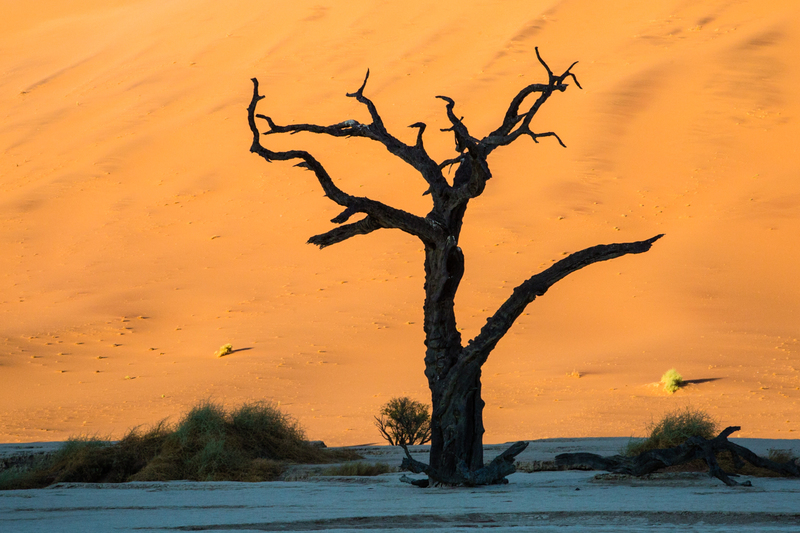 It’s believed the trees died 600-700 years ago but because it is so dry here they don’t decompose. 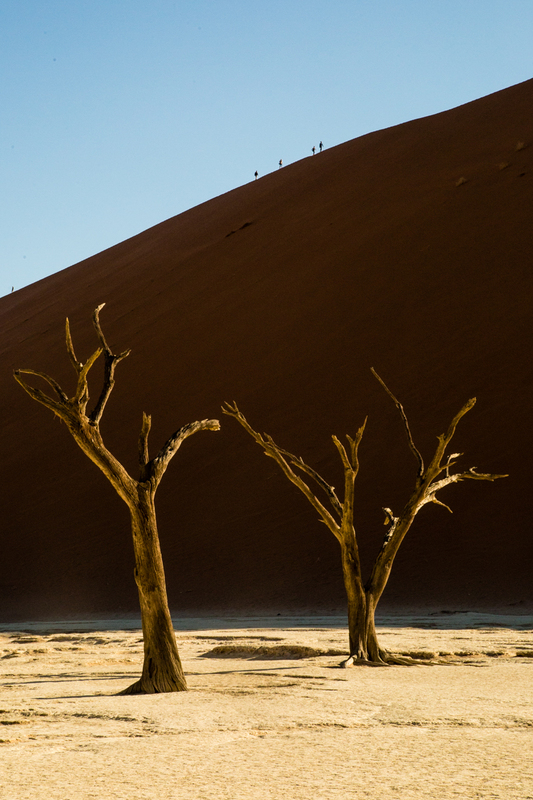 Deadvlei is about a mile and half from the parking lot for 4×4 vehicles. It’s like walking on a loose sand beach. A little up and down over the sand dunes but not to back. I was breathing a little heavy but I made it. Took me about 30 minutes to make the trip. This area was my specific goal. Here are some of the images. On the sand dune behind these trees, a dune called Big Daddy, you can see little things sticking up along the ridge. 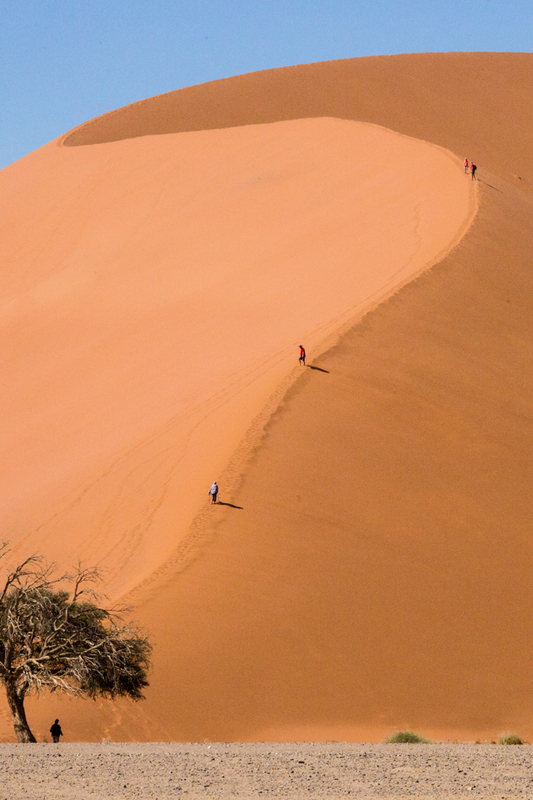 To put this into perspective….those are people who are climbing the ridge. You will notice that I don’t have any photographs looking down on these trees….for good reason. I’m not climbing that dune! 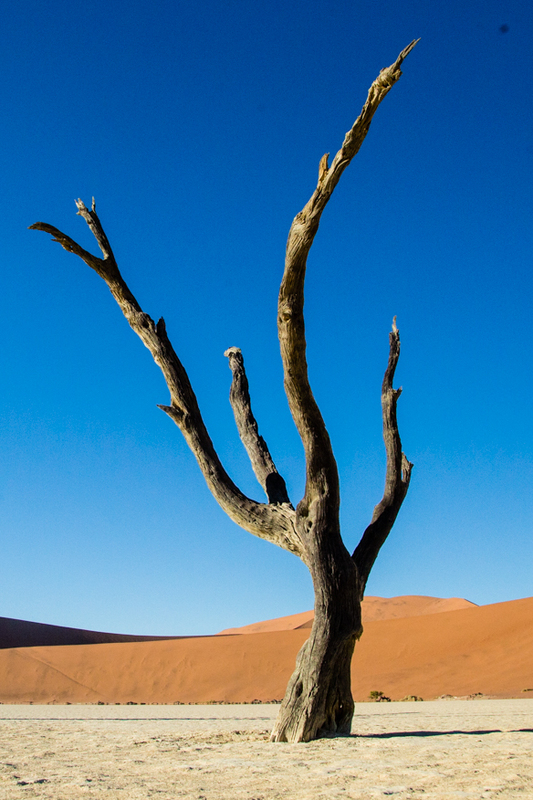 On my way back to the campground, I shot these images of some of the other dunes. I like the way the sun and the shadow played. 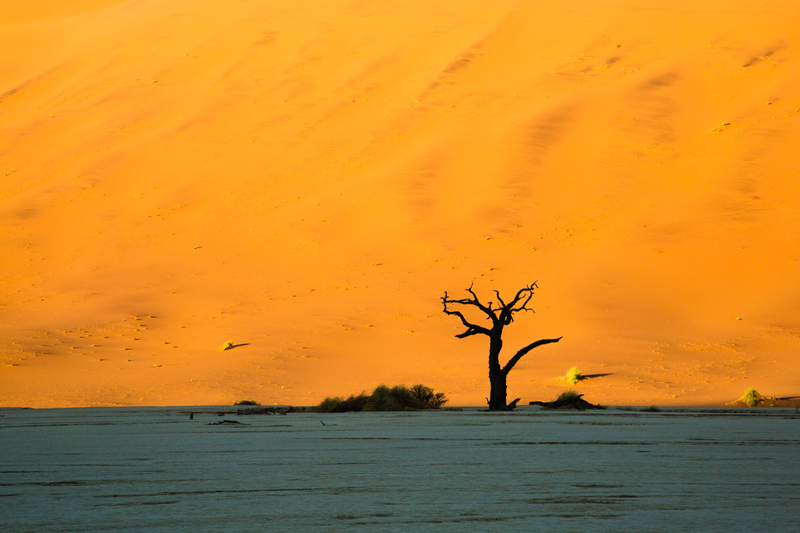 I spent two nights at Sossusvlei. 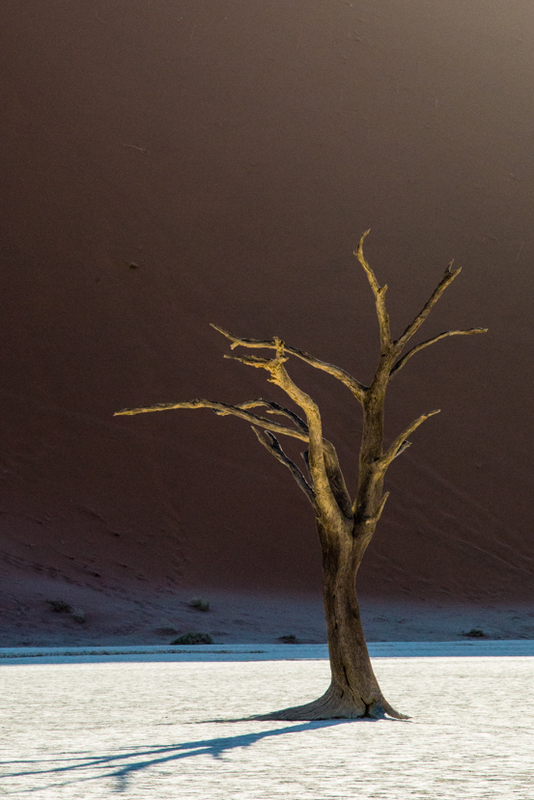 While the campground was great, I fulfilled my goal of photography Deadvlei. I had planned a hot air balloon ride over the dunes for this morning but it was cancelled due to high winds. Time to move on. Today I drove further south….to Luderitz…about 6 hours south. Tomorrow I go to Kolmonskop, a deserted diamond ghost town that is succumbing to the sand.